Check out my homemade video! I hope it gives you a better idea of who I am and how I can make your big day extra special! I’m Kimberly Sanders. When my husband and I tied the knot I loved the experience so much I wanted to do it all over again!! 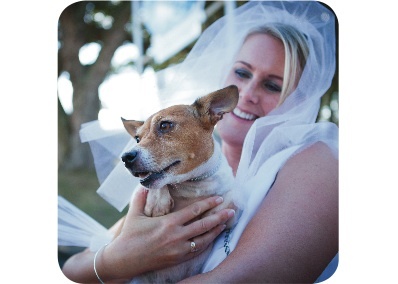 (That’s me and our little dog who was ring bearer – she stole the show!). 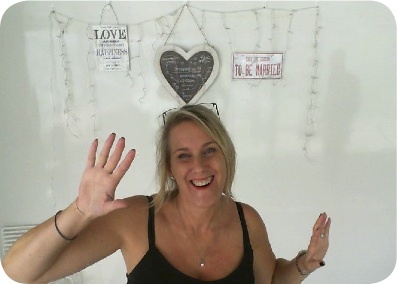 My own celebrant inspired me to become a Marriage Celebrant – and I thought, how awesome to be able to marry people! In 2014 I was excited to be appointed a Registered Independent Marriage Celebrant under NZ law. Over the years I’ve been lucky enough to enrich weddings through the honour of various roles, acting as MC, wedding planner and event manager. Plus with a background in corporate event management and the creative industry it made sense to pull it altogether and add unique value to other couple’s big days. I’ll provide you with a variety of ideas, solid guidance and a realistic sounding board to help make your wedding ceremony extra special. Living in Massey I’m close to the motorways to easily take me to most wedding venues: Kumeu vineyards, the North Shore, the City, Matakana and as far south as Bracu and Castaways … wherever your ceremony is I would love to help bring your wedding vision to life and help you create the ceremony you want. The first step in the process is for us to meet so we can get to know each other better! I finally got around to reading one of the Dalai Lama's books and just reading it gave me a sense of calmness. Journalist: Let’s not talk about difficult things like nirvana or enlightenment. But what do you want to achieve? The Dalai Lama: To be happy. My practise helps me lead a useful life. If I can give some short moment of happiness to others, then I feel that my life has achieved some purpose. This gives me deep mental satisfaction – this feeling always comes if you serve others. So, when I help others, I feel happy. For me, the most important thing is human compassion, a sense of caring for one another. What could be a more incredibly rewarding 'job' than this? !